Spoiler alert: the shortest book of the Bible is 3 John, just about 200 words long in its original Greek language. The Bible is a pretty long book, and that might give the impression that every book of the Bible is long, too. But good news! Not every book of the Bible is so long. It has some tiny documents in it. 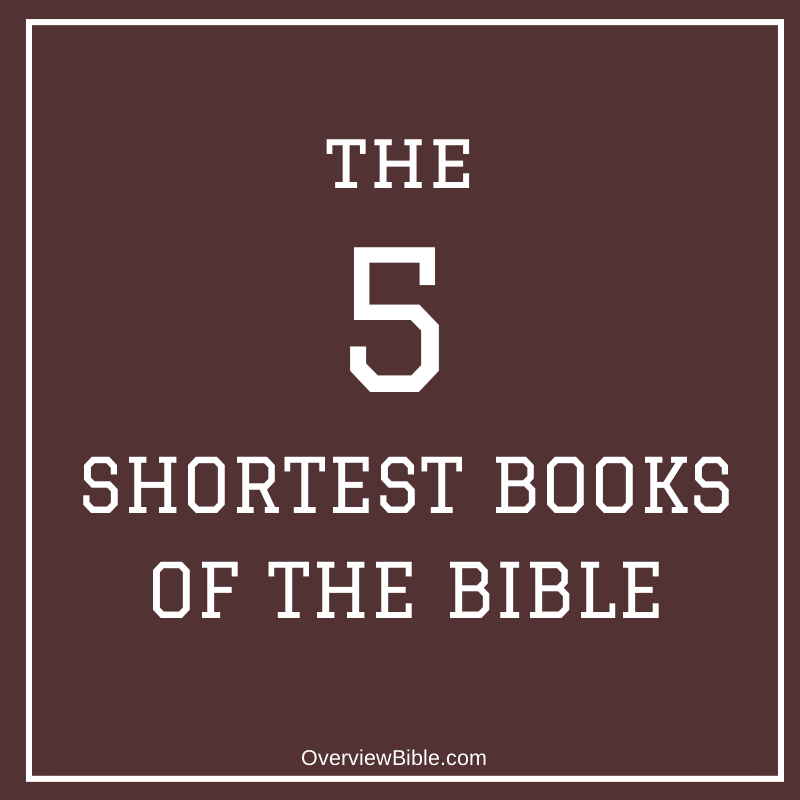 In fact, the shortest books of the Bible are shorter than this blog post. I got these word counts using Word Lists in Logos Bible Software. Again, these aren’t listed by English word count: this is from the underlying Greek and Hebrew. Because verses vary in length, and with such brief books, it’s best not to risk it. And if we were going by verse count, we’d be dealing with a different ordered list. Philemon has more verses than Obadiah (the shortest book in the Old Testament), but fewer words. Second John has fewer verses than Third John, but more words. If we were going by verse count, we’d still know the shortest books of the Bible, but we’d have them out of order. 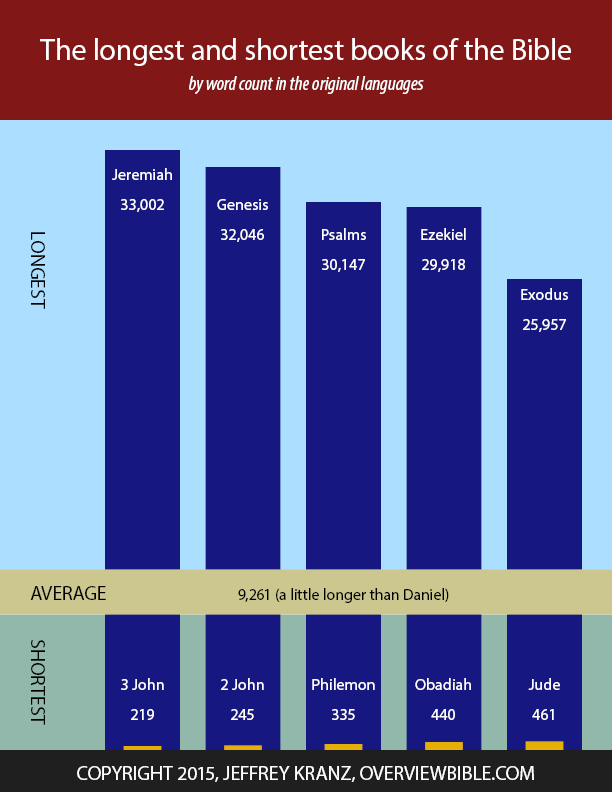 Here’s an infographic comparing the shortest books of the Bible to the longest books of the Bible. One of the best habits to form when studying the Bible is to read the entire book you’re working within one sitting. It’s certainly helped me with this project. Have you ever read the Gospel according the Matthew straight through in one sitting? Or Romans? Or Job? Or Revelation? If not, you’re missing out. That’s the way they’re meant to be read. He’s right. The Bible’s made up of letters and stories and oracles, but we tend to treat it more like a reference guide. Maybe that’s because the Bible’s so big—really, where are you going to find the time to read 150 Psalms? Reading entire books of the Bible at once can be a tough habit to get into, but starting with some of the shortest books of the Bible might help you get the hang of it. And by the way, this blog post is weighing in at around 750 words, so if you can read this sort of stuff, Third John, Second John, and Philemon will be no problem at all! So you know the shortest five books of the Bible (and the longest five, from that infographic). But what about the other 59 books in the middle? How do they line up? Well, here’s every book of the Bible, lined up from shortest to longest, with word counts. I’ve linked each book to a brief summary that I’ve written. Read more about the longest books of the Bible. Find out which books of the Bible are the least popular. I’m loving your Bible web site, Jeffrey. Being someone who tends to get tangled up in details I especially love the ability God has given you to sum things up so concisely. I think you know how much I LOVE my Word Study Bibles with study helps by dear old Dr. Z? We had awaited the first printing of those helps like little heathens waiting for Santa Clause! His work is a gift that I will be forever grateful. But we’d been given some false information which led to false expectation about if clause conditions being identified in his N.T. as well as the verb meanings….and I was disappointed that the if clauses weren’t designated with little 1-2-3-4 numbers over the if’s in the text. I mentioned my “dashed hope ” to Dr.Z, and always regretted having done so because his response was something like, “Woman, are you nuts–do you have any idea how much work went into this and how much MORE work that would be?”. I felt bad that I made him feel that I wasn’t abounding in gratitude for the blessing he had provided. But yes, I did have some idea of how much more work it would’ve been for if clauses to have been included because Precept used to *teach* how to determine if clause conditions in 2nd level workshops but, alas, it was so laborious and caused such confusion for us feeble minded folk that it was discontinued. I just thought Dr.Zodhiates was soooooo much smarter than us that it wouldn’t have been all that much more labor intensive for him. Might tackling the if clauses in the Bible be a Jeffrey-sized project you’d consider? Thanks very much, Fran! That’s a really good idea, and sounds like a fun thing to tackle. You can download the list here: http://bit.ly/OverviewBible-docs. It’s rough, but I’ll make a more human-friendly version some time later on (maybe next month). What method did you use to do this in Logos? You have inspired me to follow-up on an idea. I have unscientifically surveyed a portion of our congregation and secured the appropriate interest to lead a five week Sunday school class on these five shortest books. We Christians often skip over those texts without much through. But they have to be there for a reason. So, one book per Sunday morning, beginning in June, we are going to take a closer look. Thank you for confirming an idea. Thanks Jeffrey. I’ll plan on making use of the visual aid and absolutely give you credit. I’ll let you know how it goes. Your site is amazing! Praise the Lord! Thank you for taking the time to sum up so many topics and share with us so many ideas. Thank you again. May the Lord continue to guide and keep you producing wonderful reference material for us, His humble servants. This was pretty useful. Im only 12 and come to this website pretty often. You are a great inspiration. The Bible is Great to Read Very Day Of Week for the Year. Because, Jesus is Number #1 Forever!!!! Hope You have a Great Day and All Year for 2017 is Great for You. God, Jesus and Holy Spirit is Number #1 Forever!!!! Hi Jeffrey; This is my first visit to your webpage. I enjoyed what I read. I agree: reading a book (such as the Gospels) straight through makes it more interesting. I also like to play the audio version of the books on my computer while I fall asleep. Since I usually fall asleep before the book is finished, the next night I will play it from the last chapter or verse I remember hearing. May you continue with your fine works.